Agriculture • Company's seeds, weed-control agents are deadly, insist marchers. 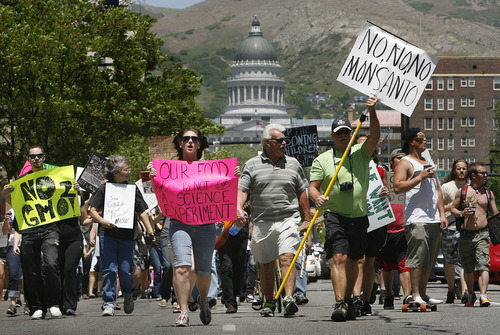 Scott Sommerdorf | The Salt Lake Tribune Demonstrators protesting genetically modified foods and Monsanto Company's business practices march from the Utah State Capitol into downtown Salt Lake City on Saturday. 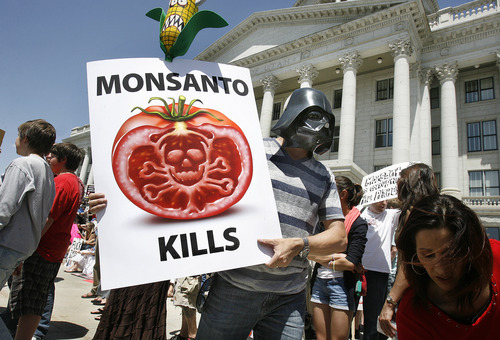 Scott Sommerdorf | The Salt Lake Tribune Loren Twede, as Darth Vader, was one of hundreds of people who participated in the March Against Monsanto at the Utah State Capitol on Saturday. The protesters said they wanted to draw attention to the dangers of gentically modified foods. 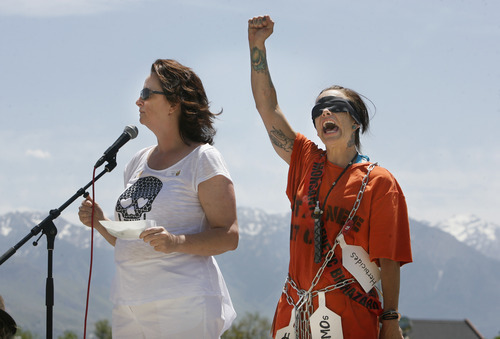 Scott Sommerdorf | The Salt Lake Tribune Melanie Zucker, left, and Heather Kasey speak to hundreds of demonstrators at Saturday's March Against Monsanto at the Utah State Capitol. 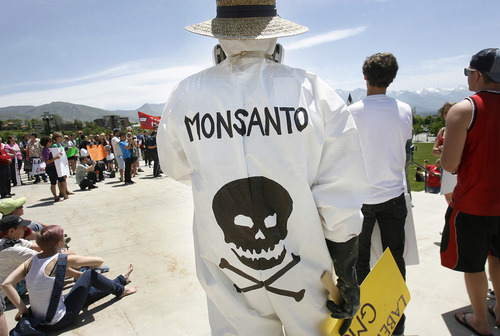 Scott Sommerdorf | The Salt Lake Tribune Kenny Phillips was one of hundreds of protesters taking part in the March Against Monsanto Saturday at the Utah State Capitol. 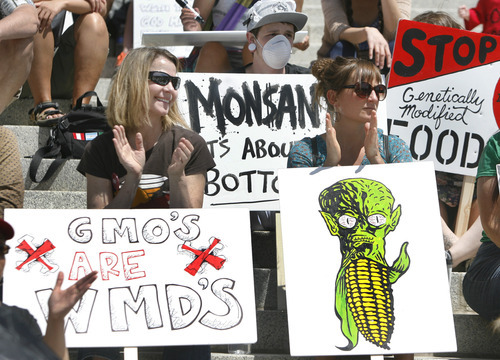 The crowd was demonstrating against genetically modified foods produced by seeds from Monsanto. 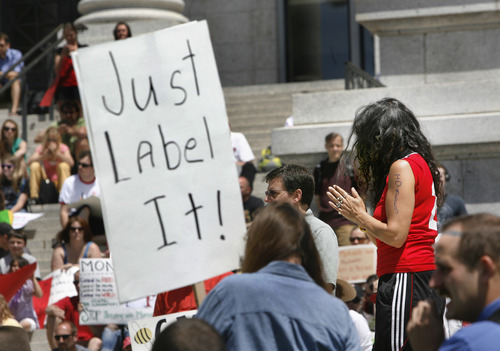 Scott Sommerdorf | The Salt Lake Tribune A demonstration against genetically modified foods produced by Monsanto seeds was held at the Utah Capitol on Saturday. Other protests were held around the United States and in other countries. 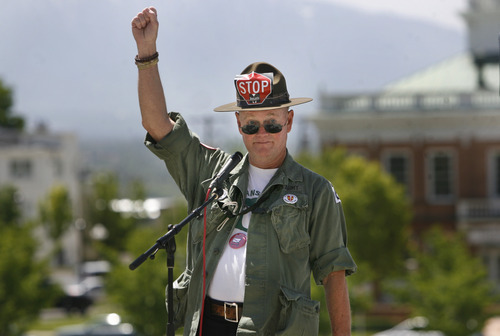 Scott Sommerdorf | The Salt Lake Tribune Marine Corps veteran Aaron Davis speaks Saturday at the March Against Monsanto, a protest of the company's genetically modified foods held at the Utah State Capitol. Other demonstrations were held around the United States and in dozens of other countries. Scott Sommerdorf | The Salt Lake Tribune A demonstration to protest agribusiness Monsanto's genetically modified foods was held Saturday at the Utah State Capitol. 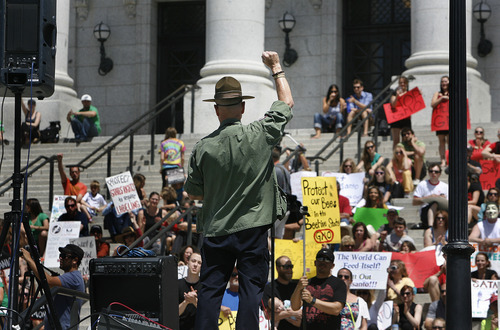 Scott Sommerdorf | The Salt Lake Tribune Marine Corps veteran Aaron Davis speaks Saturday at a protest at the Utah Capitol against genetically modified foods produced by seeds from Monsanto. The March Against Monsanto was one of many held at state capitals in the United States and in other countries. Scott Sommerdorf | The Salt Lake Tribune At a demonstration held Saturday at the Utah State Capitol against agribusiness Monsanto, a woman observes a moment of silence. Other protests against the company were held across the United States and in other countries. Scott Sommerdorf | The Salt Lake Tribune Brooke Cross was one of hundreds of demonstrators in the March Against Mansanto at the Utah State Capitol on Saturday. The demonstrators say they wanted to call attention to the dangers of genetically modified organisms. 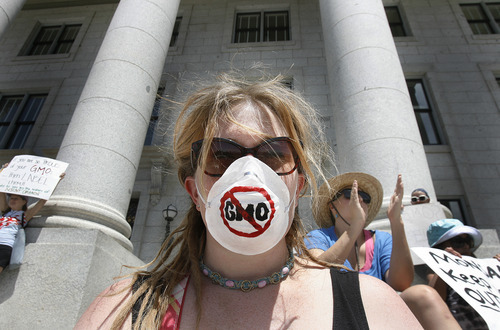 When Tami Canal of Farmington launched March Against Monsanto a few months ago, she wanted a few thousand people to participate on Saturday in a protest of genetically modified foods produced by seeds from the agribusiness. Networking with other activists, she easily exceeded that goal, with marches held in cities across the United States and in dozens of other countries by demonstrators who say genetically modified organisms (GMOs) cause serious health problems such as cancer and harm the environment. 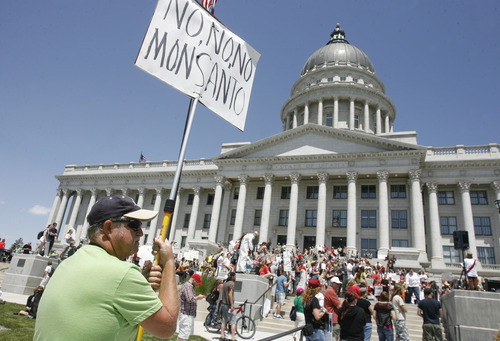 In Salt Lake City, hundreds of protesters rallied on the steps of the state capitol building and cheered as speakers criticized Monsanto&apos;s seeds and weed-control products as deadly. Angela Lynn Adams Fulton, who grew up on a farm, said GMOs lead to all sort of health problems. "We&apos;ve basically been sentenced to death, to illness, to infertility," she said. And Aaron Davis, a military veteran, pointed out that Monsanto was one of the producers of the defoliant Agent Orange during the Vietnam War. "They have a history of making the world&apos;s most toxic compounds," he said. Genetically modified plants are grown from seeds that are engineered to resist insecticide and herbicides and improve crop yields. The use of GMOs has been a growing issue of contention, with health advocates pushing for mandatory labeling of genetically modified products even though the federal government and many scientists say the technology is safe. Tom Helscher, a spokesman for the St. Louis, Mo.-based business, said Monsanto helps improve farm productivity and food quality. "Among the challenges facing agriculture are producing food for our growing population and reducing agriculture&apos;s footprint on the environment," Helscher said. "While we respect each individual&apos;s right to express their point of view on these topics, we believe we are making a contribution to improving agriculture by helping farmers produce more from their land while conserving natural resources such as water and energy." Opponents disagree that GMOs provide a benefit and claim that Monsanto hurts small and organic farmers by establishing a monopoly over the world&apos;s food supply and bullying them into buying only the company&apos;s seeds. They also said that genetically modified crops and the use of Monsanto pesticides have a strong correlation to the collapse of bee colonies. Cara Warren, who lives in Marriott-Slaterville in Weber County, said she came to the protest because of the importance of finding a way to boost the food supply without the "horrific consequences." "I&apos;m not against science, but we need to take a look at the big picture," she said.